Because it’s simple, user-friendly, and multi-functional, it’s no wonder why many organizations immediately turn to Eventbrite (and the Eventbrite Salesforce integration) for their event management needs. But is it true that Eventbrite is the best Salesforce event planning solution out there, or is there more to the story that many organizations just aren’t aware of? While Eventbrite is the go-to event planning platform for many organizations, there are a number of considerations that event planners—particularly those using Salesforce as their CRM—should know before they start planning their next event. Eventbrite isn’t native to Salesforce. Eventbrite doesn’t cater to specific organizations. Eventbrite can’t meet complex event management needs. Let’s examine these points in more depth. 1. Eventbrite isn’t native to Salesforce. Eventbrite is a web-based event management platform that was built to work independently, not as a part of Salesforce. Because of that, it’s what’s considered a non-native Salesforce application. Non-native apps don’t run entirely within Salesforce. Native apps were built in Salesforce, so they function as an extension of your CRM. Non-native apps are totally separate platforms, so there’s no guarantee they’ll be working when Salesforce is, or that the third-party platform will be compatible with the rest of your Salesforce system. Non-native apps require manual integration. You’ll have to go through a potentially complex integration process to transfer data from Eventbrite to Salesforce. There are dedicated apps to help integrate the two platforms, but be aware that those might come at an extra cost. Non-native apps store data externally, which can hinder your security. Native apps adhere to the same data security standards that the rest of Salesforce does. Since third-party apps do not, you’ll need to take extra precautions when transferring data between the two platforms. Plus, when you’re operating out of two separate systems, you’ll always run the risk of working with incomplete or inconsistent data—which isn’t very helpful when you’re creating an event strategy! What’s the opposite of a non-native app? A native app, of course! Native Salesforce applications were built to run exclusively within Salesforce, so there are no cumbersome integrations to keep you from effectively planning an outstanding event. Instead, all of your data will immediately (and consistently) be available in real time where you need it: your Salesforce CRM. To learn more about the benefits of native apps, we recommend checking out this thorough post on the subject. 2. Eventbrite doesn’t cater to specific organizations. Eventbrite is a broad platform designed to flexible enough for any individual or organization to use it easily. While that can be a good thing, it also means that Eventbrite offers little-to-no insight when it comes to planning your event. If you’re looking for help with a particular type of event, you won’t get anything besides the basics. Whether you’re hosting a conference, fundraising gala, or family reunion, you’ll be utilizing the same functionality and will receive the same customer support. Customize your registration page. Eventbrite makes it easy to add photos and your own color scheme to your event page, but the customization options beyond that are limited. To really capture guests’ attention, you need your registration page to be reflective of the event, with relevant fields and a unique, appealing look. Provide flexible ticketing options. With Eventbrite, you can easily set up multiple ticket prices. However, you may find it difficult to sell group tickets, add merchandise or donations to ticket sales, or create personalized pricing options restricted to specific constituent segments. Connect with speakers and sponsors. As a ticketing app, Eventbrite does a good job of helping you focus on your guests. That focus makes sense for some events, but for trade shows, conferences, or other events with many kinds of active participants, such as speakers and sponsors, Eventbrite leaves a major gap in the event management process. And if you do run into problems attempting to configure Eventbrite to your event strategy, keep in mind that their customer service team likely won’t have the in-depth event management expertise to assist with your specific event. If you’re planning events on a regular basis, you need an event management solution that responds to your strategy. Before you commit to any event management platform, work with your organization to determine what you need from your event management software. If your organization is routinely planning similar events, look for a solution that was designed with that type of event in mind. For example, conference hosts will need a much more robust solution than a small office looking to schedule weekly team meetings more efficiently. There may even be differences in the features that an event-specific software might offer. For example, let’s say you’re a nonprofit organization looking for technology to streamline the event fundraising process. While all solutions might offer event ticketing or registration tools, you may also need peer-to-peer fundraising functionality, online auction tools, or eCommerce features to sell merchandise. Alternatively, if you’re an organization or business who plans all kinds of events, you’ll need something that’s both flexible and functional. Take a look at how Fonteva Events enables event planners to create dynamic schedule items, each with their own category, permissions, capacity settings, and ticket types. This tool couldn’t be more perfect for an event host with a variety of needs. Once you know what your event needs are, start checking out the top solutions for managing what’s most important to you! 3. Eventbrite can’t meet complex event management needs. Eventbrite was also designed to be simple as well as broad. Again, in many ways, that’s a definite pro for event planners, but in other ways, the simplicity leaves much to be desired for event managing teams who need a robust, capable platform. If you need your event management software to carry the bulk of the weight during the event planning experience, Eventbrite likely isn’t the solution for you. Logistics. Within Eventbrite, you’ll have no way to manage venue or setup logistics, seating assignments, speaker content, or floor plans. In more comprehensive applications, you can collaborate with your team to manage all of those factors within the same platform, providing a more holistic view of your event. Promotions. Marketing is one of the most important elements to consider as you plan your event, and with Eventbrite, you have very limited options for how you’ll get the word out. If you use Eventbrite as your main event management tool, you’ll probably also need to use other dedicated solutions to manage email marketing, direct mail, and your event website. Attendee data. When you use a platform that’s seamlessly connected to Salesforce, you’ll have all your constituent data at your fingertips. With Eventbrite, you’ll have to integrate any registrant data you collect with your Salesforce CRM, which makes using that information to inform your event strategy much more difficult. A lot goes into planning an event, and Eventbrite simply wasn’t built to handle every need your organization may have! If you’re concerned that Eventbrite won’t be able to accommodate the full scope of your event, it’s time to start searching for a more multifaceted solution. Especially for less experienced event planning teams, you may be concerned that comprehensive event management software will be difficult to use. Luckily, the right event management software won’t force you to sacrifice user-friendliness for a robust feature set! For example, look at how Fonteva Events allows you to manage event information, ticketing, venues, promotions, speakers, and more all from one simple event builder tool. 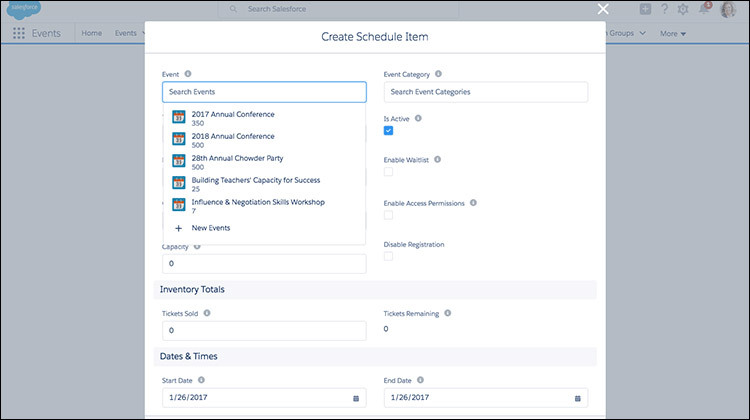 When you find a Salesforce event management app with all of the features you need, you’ll have access to everything you need to plan a stellar event all in one platform! Top Eventbrite Alternatives. If you’re looking for software like Eventbrite, we’ve got the post for you! These Eventbrite competitors have all been reviewed and tested to ensure you find the best event planning solution sooner rather than later. Top Cvent Competitors. Another popular event management tool, Cvent is well-known for being an end-to-end solution for large organizations. If that sounds like the right solution for you, check out Double the Donation’s list of event management options that are similar to Cvent—but even better! Top Salesforce Partners for Planning Events. Double the Donation has compiled a list of all the top Salesforce event management solutions on the market. Before hitting the AppExchange, read this breakdown of the best software options for organizations like yours!